While five films earned over $10 million last weekend, it was arguably the dullest weekend at the box office 2013 has had, with three-week old Identity Thief returning to the top. No longer distracted by the Oscars, Hollywood fixes that this weekend, launching four new releases to clear up some of the driftwood still hanging around. Jack the Giant Slayer is a big budget adaptation of the fairy tale of the same name, with some Jack and the Beanstalk thrown in for good measure. Fie fi fo fum, the giants are big and ugly and we need lots of guys in armor and some catapults to try to bring them down but we obviously know who the big hero will be: the one named in the title. Nicholas Hoult plays the titular Jack after raising his profile with Warm Bodies a month ago. Other notable names featured include Stanley Tucci, Ian McShane, Bill Nighy and Ewan McGregor. The director is Bryan Singer, taking the helm for the first time since 2008's Valkyrie, though he's got X-Men: Days of Future Past (which also stars Hoult) coming next year. In 3D because duh, it's getting an ultra wide release in over 3,500 theaters. The first thought on how Jack will perform is to look at John Carter, which flopped terribly around this time a year ago. Well, at least as much as a $30 million opening is a flop. But then again, it finished with $73 million against a supposed $250 to $300 million production budget so, yes: flop. Anyway, Jack the Giant Slayer has much more going for it than John Carter did: it's got a more recognizable story, is considerably more family friendly and has a fairly decent trailer (and only cost a mere $190 million to make). While it's going to be dwarfed (see what I did there?) by Oz the Great and Powerful next weekend, it still pretty much has this weekend to itself. 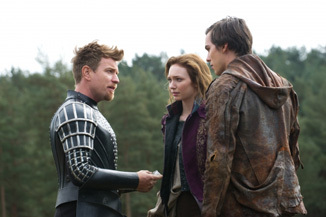 Jack the Giant Slayer wakes up the box office from last weekend's doldrums, and I smell a weekend of about $36 million.